Twenty-three years can be a long time. Or not. 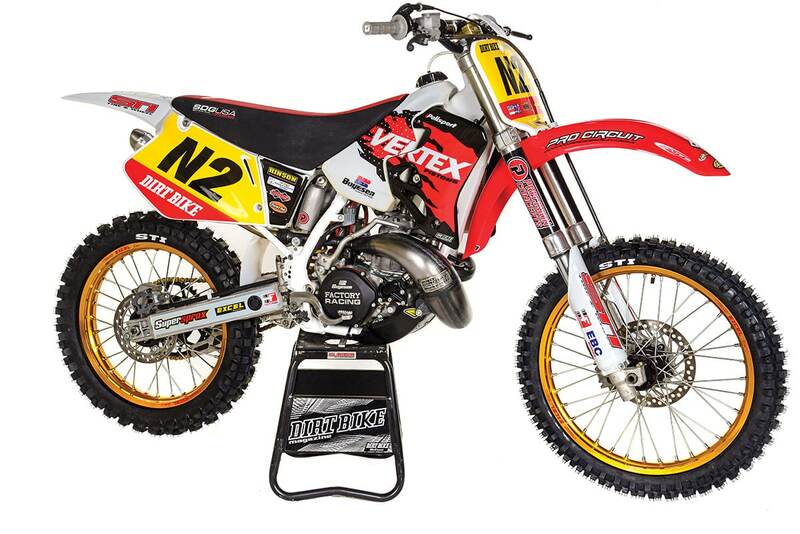 When it comes to the evolution of motocross bikes, it depends on which 23 years you’re talking about. 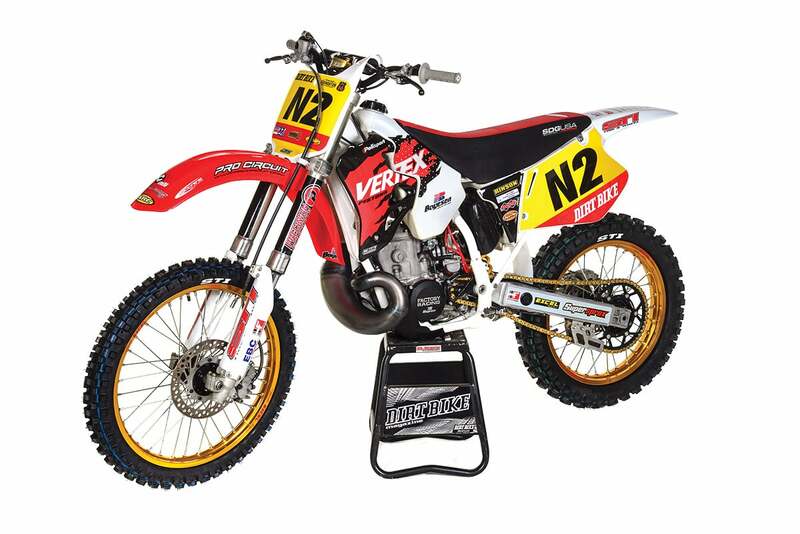 No bike illustrates that better than the 1995 Honda CR250R. The designs and concepts used on that bike are still alive and well on two-strokes today. Some might even say we’ve made no real progress since then. Putting new graphics on an old bike changes your attitude very quickly. Decal Works did an amazing job. You can debate which bike was the best of 1995, but I was there. 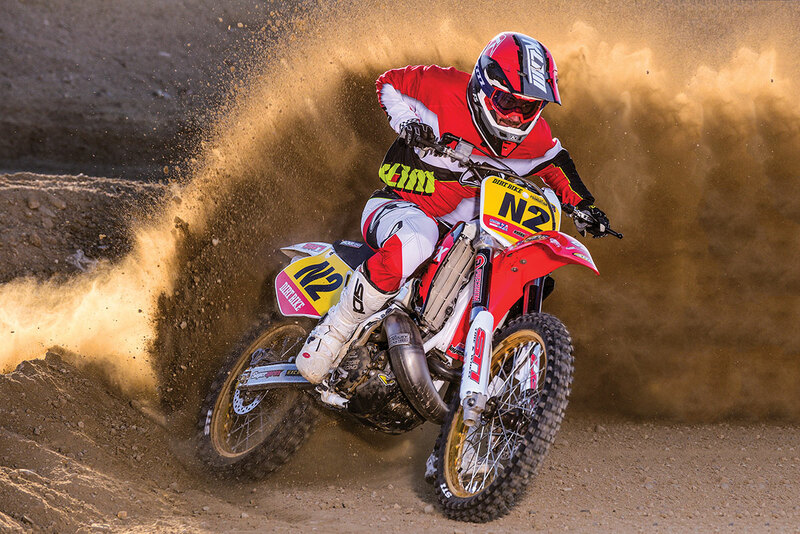 The Honda CR250R was first or second in every shootout throughout the ’90s. 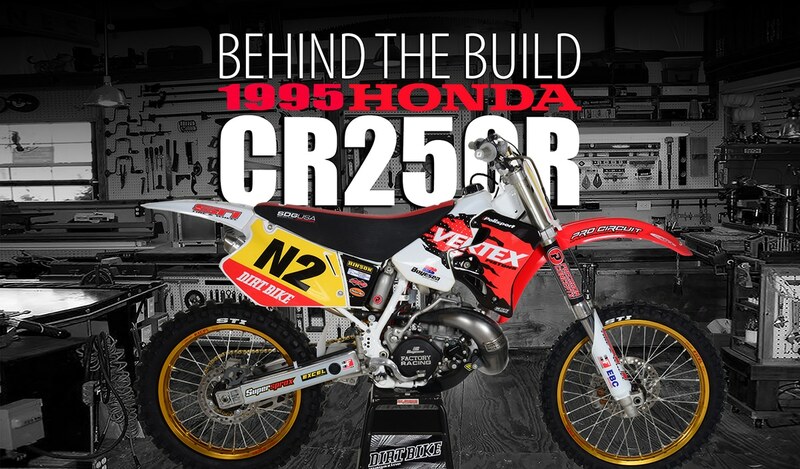 The CR had the same basic motor from 1992 to 2001, and it was really, really good. It still is. The chassis changed more often than the motor in that era. 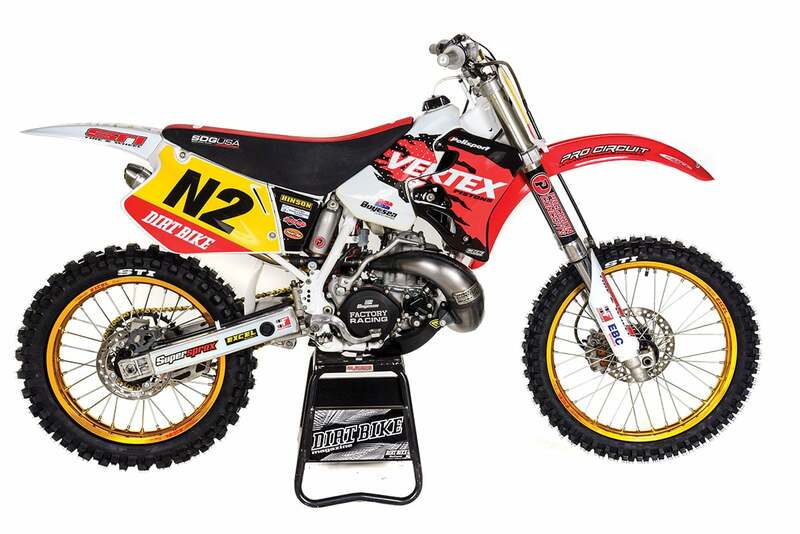 Jeremy McGrath did most of his winning with the 1993 frame, which had been developed earlier by Jean Michel Bayle. There were subtle chassis changes on an annual basis until the mother of them all came in 1997. That was the much maligned move to the ultra-rigid aluminum chassis. Even that bike had a lot going for it, including a twin-chamber fork and a very fast motor. Everything changed in 2002 with the arrival of an entirely new bike. By then, four-strokes were taking over, and by 2007, the CR250R was completely gone, along with all of Honda’s two-strokes. As it arrived, the 1995 Honda wasn’t pretty, but most of the original parts were there. That’s gold in the bike restoration world. So, the 1995 is an iconic Honda CR250R that represents a whole era well. It’s a perfect subject for a Revo-class project for a bunch of other reasons too. There are a zillion of them out there. They’re cheap, and parts grow on trees. Don’t underestimate the value of that last fact. I’ve recently done restorations on a 1991 KTM 300 and a 1988 Kawasaki KDX. Parts are hard to find for both. The Honda, on the other hand, is still supported by the aftermarket. My friend Bob Casper is a longtime advocate of old Hondas, and he found one for me almost immediately. The price was $750. It was rough. It had been looped out on the pavement and had a lot of superficial asphalt rash. None of that worried me. Most parts for the old Honda are cheap. As as I was to discover, though, all old bikes have a number of secrets that only time and work can extract. A massive air leak was well hidden. Believe it or not, it ran like this. I planned on doing the restoration in stages. First, it just needed to run. 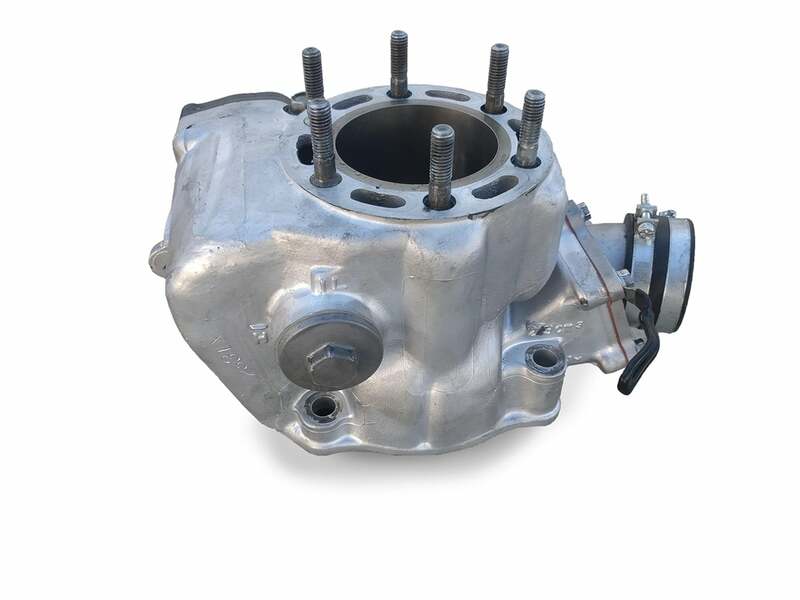 I thought that would just require a top end and clutch—a Vertex piston, a Hinson clutch and a couple hours of work, right? Wrong. The bike had a massive air leak. I replaced the main seals with a kit from All Balls Racing, but that solved nothing. The bike would rev up like crazy as soon as it was started. There were secrets within. The frame was powder coated by San Diego Powder Coat early in the process. A Scott’s steering damper post was welded on first. It turned out that there was a hole in the crankcase the size of a dime. The damage was completely hidden from view and led to a passage that acted as a water drain from the ignition compartment. It looked as though a piston skirt had broken at some point in history and debris had done the damage before going up through the transfer ports and out the exhaust. Lucky break, because there appeared to be no damage to the cylinder. There are no new 1995 cylinders available in Honda parts stores. The 2000 cylinder is still in stock, but supplies are low. What happened next shook my confidence in the project and my own abilities. I got the hole welded up, and when I was reassembling the motor, I installed all-new bearings. As I said, the aftermarket supports the engine well, and All Balls sells complete bearing kits. They don’t, however, sell common sense. I installed the countershaft bearing upside down! The result was a cracked engine case. The motor survived years of abuse, but its worst injury came at my hands. Confessions of a lousy mechanic—not all of the damage came from previous owners. Some of it was homegrown. After that, I made every mistake possible. There were torn gaskets, left-out parts and error after error. I’ve never considered myself a great mechanic, but this job turned into a comic tragedy. Was it age, failing memory or failing vision? Yes to all. Eventually, the cases were welded up (again) and the engine went back together to sit on the bench while I worked on the chassis. The motor had a bunch of new parts, a new Boyesen Rad Valve and several new OE parts, such as the kick-start gears. A Pro Circuit Works pipe and silencer were on the shelf ready to go. It looked great, but I was terrified that I had messed up something big. Arc Memlon levers might not be period accurate, but forgivable. Mark Tilley tells me that the proper way to build a project bike is to send the motor in one direction, send the chassis in another direction and then just assemble the pieces. A man’s gotta know his limits. There’s some wisdom there. I sent the suspension to Precision Concepts to have it rebuilt and re-valved. I sent the frame to San Diego Powder Coating after having a steering damper post welded on. As much as I loved the 1995 Honda, I remembered the head-shake of the ’90s all too well. The Honda would have to share a Scott’s steering damper with my modern bike. 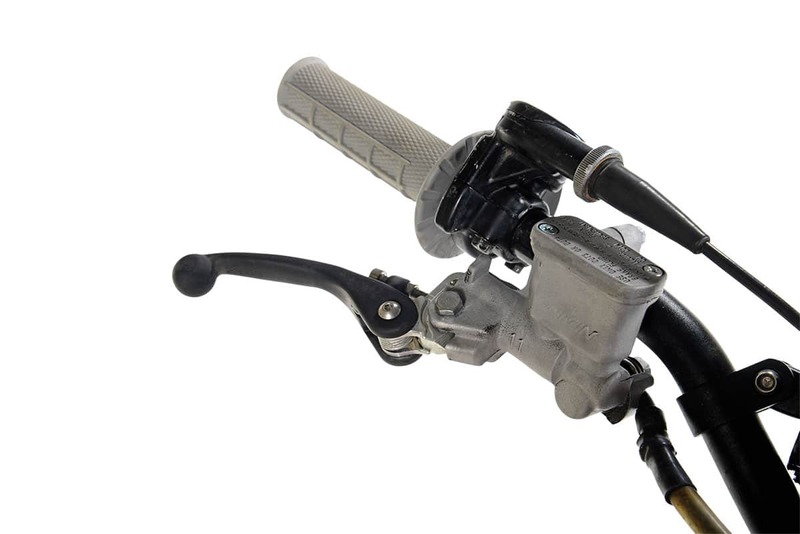 The Scott’s Steering Stabiizer was critical, but mounting kits are hard to come by for early bikes. Check eBay if Scott’s can’t help. The wheels originally went to FasterUSA for a rebuild with new Excel gold rims, but the stock hubs looked a little shaky. I eventually settled on an entirely new wheelset. At $1139, that was the most expensive single component on the rebuild. The FasterUSA stuff is first-rate—not cheap Asian copies—and I figured I would keep the wheels forever. I managed to reuse the stock rotors but with new Supersprox sprockets and an RK chain. 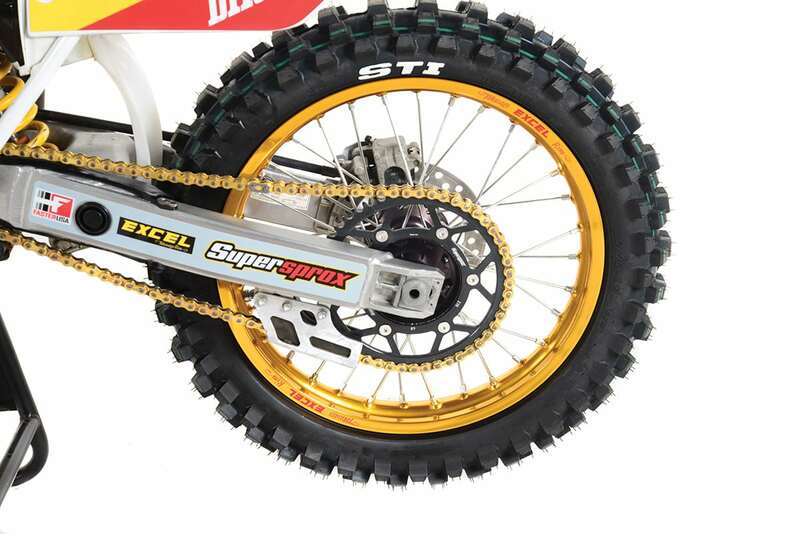 I decided to go with STI’s new Tech 2 tires on the advice of Justin Jones, who’s been using them in the WORCS races. The cosmetic stuff was easy. Polisport has full bodywork kits that are amazingly inexpensive. Instead of getting the ’95 kit, I got the pieces individually in order to match the color combo that McGrath used. Decal Works then finished it all off with full graphics. There were a few other hiccups along the way. I had to have a massive crack in the swingarm welded, for one. STI Tech 2 Tires came from the advice of Justin Jones. I’d like to say that my fears were unfounded. I’d like to say that after messing up the reassembly of the motor so many times, I got it right when it mattered. Not so. For the bike’s first post-restoration race, it ran terrible. They mixed the Revo class with the Evo and Vintage classes, and it was all I could do to keep up with bikes that were 20 years older. It turned out I had left out a power-valve bushing. It was sitting on the workbench. So it goes. Then I had three options. 1. Find a new cylinder, 2. bore the one I had to the next oversize and install a Wiseco piston (one of the very few companies that make oversize pistons for this bike) or 3. Do something completely weird that the guys at U.S. Chrome suggested. They could put nikasil over the steel. I asked Terry Varner if he ever heard of such a thing, and he said he did it all the time to CR500R motors, which always came from the factory with steel liners. It required slightly more clearance than nikasil-over-aluminum because of the different expansion properties of steel. Sounded good to me. The process was a little over $300. U.S. Chrome put a nikasil coating over the non-original steel liner that they discovered in the Honda cylinder. So many failures made success that much sweeter. The bike ran perfectly the next time out. It started easily, ran crisply and was really, really fast. The bike can hold its own against any modern 250 two-stroke. The only thing it gives up is the width of the powerband—it hits hard and signs off a little early. 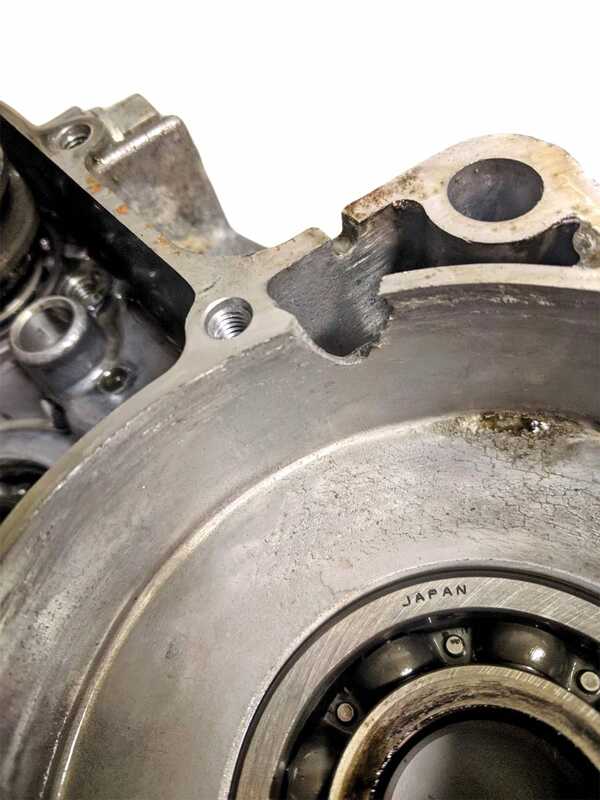 It also has some vibration, but that might be the product of a 23-year-old crankshaft. It was the one part I didn’t replace. 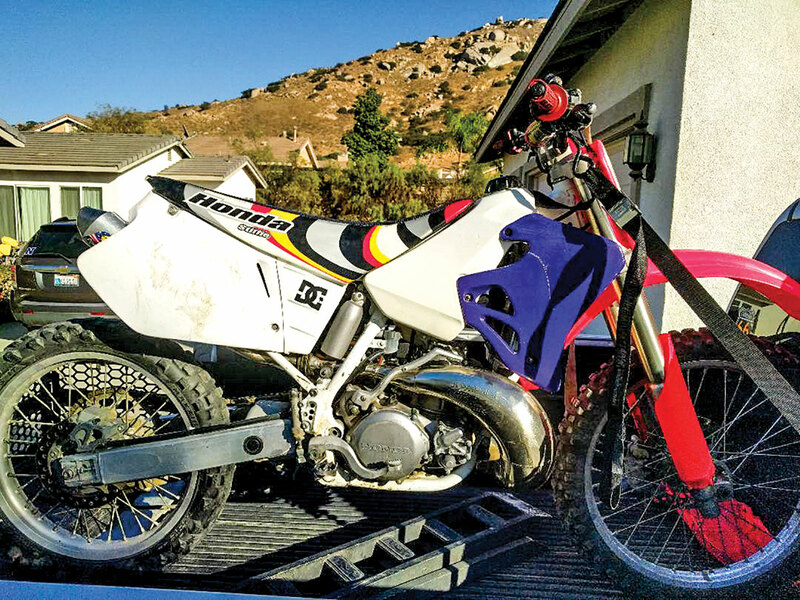 Is the Honda CR250R the best representative of MX bikes from the ’90s? Absolutely! 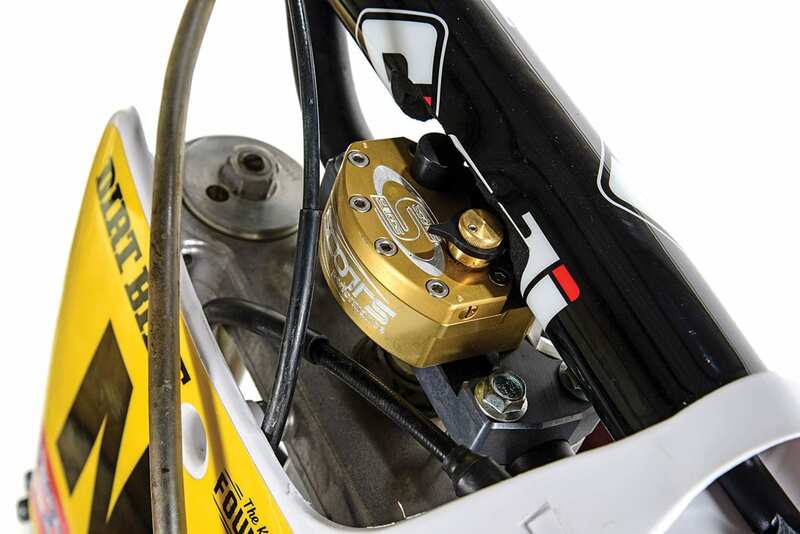 The old fork and shock give up a little more to modern components. In 1995, Honda switched to KYB, and it didn’t go well. It was, in fact, a step backwards. Precision Concepts did a good job of salvaging what I gave them, but there’s no getting around the fact that it was a 23-year-old fork that wasn’t very good 23 years ago. It was usable, but not comfortable. Most Honda Revo riders commit a minor rule infraction by using a fork from a later model. I saw a 2005 CRF450R fork for $200 on eBay last week. We’ll see. In overall handling, though, the bike is a huge success. It turns really well and, with the steering damper, is perfectly stable. At first I had a hard time with the scrunched-up rider layout, but after SDG built a taller seat, it was fine. So, does the Rocket go just as fast as a modern 250cc two-stroke? Yes. The clutch pull is a little harder. The brakes are a little weaker, and you have to shift more, but all that is OK the first time you pass a modern bike. 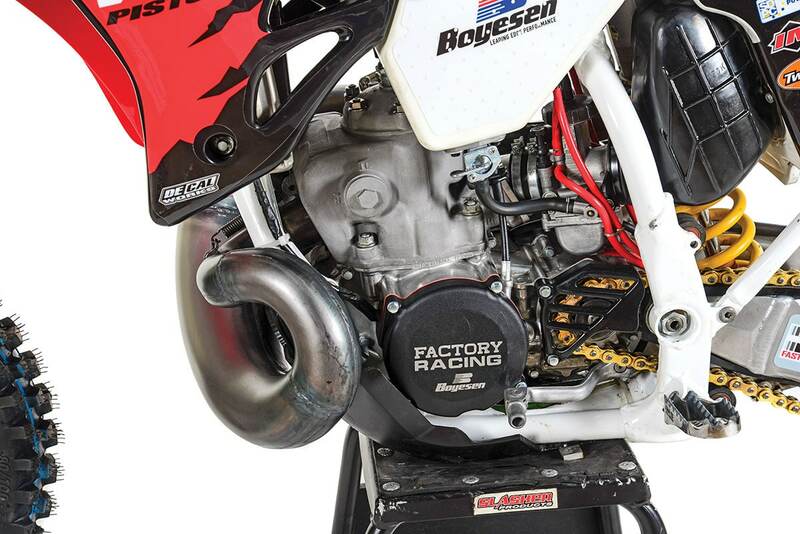 I originally built the bike for Revo racing, but why stop there? I think the bike hasn’t even reached middle age yet.